The hundredth car to leave the Koenigsegg factory in Sweden gets some authentic 24-karat gold trim. There are companies mass-producing automobiles by the thousands, and there are others making them one at a time. Fiat may have just built its millionth 500, and Honda exported its millionth Accord from the United States, but over in Sweden it&apos;s another story. 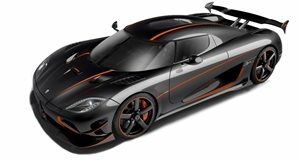 That&apos;s where Koenigsegg makes the Agera, like it made the CCX and its derivatives before it. All told, the House that Christian Built has only made a hundred cars over its ten years of production, and to mark that occasion, it has launched this one-of-a-kind Agera R.
Called the Hundra edition (from the Swedish for "hundred", as you might have surmised), the special Agera is characterized by its gold trim. And by that, we don&apos;t mean gold-colored. We mean actual gold, as in 24-karats of the shiny stuff in the form of gold leafing trimming the bodywork and golden threads embroidering the cockpit. Bearing a retro resemblance to the classic Lotus livery, the gold contrasts with the bare lacquered carbon fiber bodywork and the black upholstery inside, over which the embroidery crisscrosses to form a diamond-quilt pattern on the seats and headliner.